This invention relates to development of an iontotherapeutic device for regulated transdermal systemic administration of ionizable pharmaceutical compounds. It also provides an iontotherapeutic process for transdermal administration of ionized pharmaceuticals, particularly those which are otherwise transdermally absorbed to a small degree or not at all, such as peptide pharmaceuticals, for example, insulins. The invention also relates to unit dose forms, for example, those in which an ionized pharmaceutical is dispersed in a hydrophilic polymer. The unit dose is adapted to be assembled as part of the pharmaceutical reservoir electrode, so that the ionized pharmaceutical will be delivered transdermally and then be absorbed systemically when the iontotherapeutic device is in operation. This application is a cont inuation- in-part of U.S. Application Serial No. 890,702 filed July 25, 1986. This invention relates to development of an iontotherapeutic device tor regulated transdermal systemic administration of ionizable pharmaceuticals (including ionizable biopharmaceuticals). Many pharmaceuticals are required to be administered to patients by injection. A notable example is insulin, which cannot be administered orally to be effective in lower ing the elevated blood sugar levels, which are too high in diabet ics (i.e. , > 126 mg/dL) . Other pharmaceuticals may be administered orally, but in some cases , there is inefficient absorption into the bloodstream to permit the pharmaceuticals to achieve their intended therapy. Also, with regard to oral administration, many orally administered pharmaceuticals undergo a high degree of destruction by the hepato-gastrointestinal first-pass metabolism. Often the metabolites of the first-pass metabolism cause unwanted biological activity or toxicity. In oral administration, there are var iables w hich cause undesirable variations in the extent of gastrointestinal absorption from subject to subj ect , especial ly in the case of some pharmaceuticals ; and there ar e also associated pr oblems of uneven blood levels resulting f rom an initial large absorption w ith attendant undesirable side effects or toxicities, and subsequent blood levels which are less than therapeutically optimal. HCl , has not been satisf actor ily developed for adequate therapy, since they have not been absorbed transdermally to any significant degree. The hazard and discomfort of administration of pharmaceuticals by injection, especially if therapy is required on a frequent basis, such as the subcutaneous injection of insulin for diabetes therapy, which is required daily, are universally known. There has long been a desire to avoid the necessity of therapy by injection. Investigations have been carried out to explore the possibility of delivering certain therapeutic agents topically by use of a direct current (DC) iontophoresis. For example, it has been found that fluoride ions can be assimilated into the structure of a tooth with the aid of DC iontophoresis. Also, localized "sweating" has been caused by delivering to the skin a sweat-inducing compound, such as pilocarpine, using a direct current. The induced sweat is then assayed using an electrode to determine its chloride ion concentration for diagnosis purposes. A low chloride content in the sweat indicates that a patient may be suffering from cystic fibrosis. Application of a DC iontophoresis can be uncomfortable particularly when the level of applied current is at a high level, in the case of certain pharmaceuticals, in order to achieve a systemic therapeutic level. A process has been found for administering transdermally a systemically effective amount of an ionizable pharmaceutical in sterile aqueous solution using an iontotherapeutic device such as provided by this invention. The ionized pharmaceutical solution can be contained in a unit dose form such as disposable polymeric matrix unit dose form in which a dosage amount of an ionized pharmaceutical solution (pH desirably at least about 1.0, 1.5 or about 2 pH units above or below the pKa or isoelectric pH of the ionizable pharmaceutical) is intermixed with a polymer which is characterized by being compatible with the pharmaceutical as well as the skin, hydrophilic, and capable of releasing the pharmaceutical for iontotherapeutic transdermal absorption. The unit dose form can also comprise a sterile solution of the ionized pharmaceutical contained within a closed reservoir unit dose form having a drug-releasing microporous membrane surface. The unit dose forms are assembled with a pharmaceutical reservoir electrode and are further adapted to permit the dissolved, ionized pharmaceutical to be delivered iontophoret ically to the skin of the subject treated and to provide iontotherapeutic transdermal absorption of a systemically effective amount of the pharmaceutical. The unit dose forms are maintained covered to retain sterility until the desired time of iontotherapeutic administration. A pharmaceutical reservoir electrode which will receive such a unit dose form is used as a part of the iontotherapeutic device, such as provided by this invention, which is used to carry out the iontotherapeutic delivery and transdermal absorption or the ionized pharmaceutical. The pharmaceutical reservoir electrode is either a cathode or an anode depending upon whether the pharmaceutical is in anionic or cationic form, respectively. The iontotherapeutic device provides, in the process, an iontotherapeutically effective and physiologically acceptable pulse current with a specific waveform having an amplitude up to about 10mA based on a reservoir electrode skin-contacting area of about 5cm2 and an effective frequency of at least about 10 Hz up to about 50 KHz until the subject treated has received a pharmacologically-effective systemic dosage of the ionized pharmaceutical. Also, provided by this invention is a unit dose form adapted for use in a pharmaceutical reservoir electrode and to be used in electrical contact with intact skin of a subject to be treated with the pharmaceutical. The unit dose can have a polymeric matrix in which the pharmaceutical is ion zed and in solution and also contained and distributed within the polymeric matrix. The polymer of the matrix is compatible with the pharmaceutical as well as the skin, permits release of the pharmaceutical from the unit dose form, so it can be iontotherapeutically delivered for transdermal absorption. The polymer used is hydrophilic. The pharmaceutical in the unit dose form can be selected from pharmaceuticals which ordinarily are not transdermally absorbed through intact skin in an effective dosage amount, such pharmaceuticals including but not limited to insulins, vasopressin, heparin, growth hormones, glucagon, oxytocin, and other macromolecular drugs as well as a number of others which can be provided in ionized form. A number of compounds which are naturally-occurring in humans, and which often are peptide in nature, are also included within this pharmaceutical group, many of which can be produced identically or as a related compound using DNA recombinant or other biological techniques. Also provided by the invention is a novel iontotherapeutic device capable of transdermally administering a systemically effective amount of an ionized pharmaceutical. 5) a second electrode adapted to be in electrical contact with the intact skin to be treated and forming with said pharmaceutical reservoir electrode a combination of anode and cathode electrodes. FIG. 1 is a diagram portraying a device of the invention in operation to effect iontotherapeutic transdermal absorption of an ionized pharmaceutical and its uptake into the bloodstream of the subject treated. Wave Generator shown in FIG. 2. FIG. 5 is a detailed circuit diagram for the Trapezoidal-Triangular Wave Generator shown in FIG. 2. Signal Generator shown in FIG. 2. Circuit shown in FIG. 2. FIG. 8 is a block diagram of a wristwatch-type miniaturized periodic iontotherapeutic device coming within the invention, in which the drug reservoir electrode is positioned away from the main portion of iontotherapeutic device. FIG. 9 is a diagram illustrating the wristwatch-type miniaturized transdermal periodic iontotherapeutic system with the drug reservoir electrode positioned directly in the lower portion of the iontotherapeutic device and with multifunctional programmability. F IG. 10 is a block diagr am of a por table tr ansder mal periodic i ontotherapeutic device coming within the inven tion . FIG. 11 is a detailed circuit diagram of the device shown in FIG. 10. FIG. 12 is a block diagram of a multichannel transdermal periodic iontotherapeutic device coming within the invention. FIG. 13 is a detailed circuit diagram of the device shown in FIG. 12. 1/1; frequency = 2KHz) for 40 min. FIG. 16 is a graph showing the effect of the frequency generated by the transdermal periodic iontotherapeutic system on the reduction in the blood glucose level (B.G.L.) in the diabetic hairless rats using insulin. FIG. 17 is a graph showing the effect of the on/off ratio in the transdermal periodic iontotherapeutic system on the reduction in the blood sugar level (B.G.L.) in the diabetic hairless rats using insulin. FIG. 18 is a graph showing the effect of the treatment duration by the transdermal periodic iontotherapeutic system with drug reservoir electrode at pH 3.6, on the reduction in the blood glucose level (B.G.L.) in the diabetic hairless rats using insulin. FIG. 19 is a graph showing the effect of the treatment duration by the transdermal periodic iontotherapeutic system, with drug rese rvoir electrode at pH 7.1, on the reduction in the blood glucose level (B.G.L.) in the diabetic hairless rats using insulin. FIG. 20 is a graph showing permeation of vasopressin facilitated by the transdermal periodic iontotherapeutic system compared to passive diffusion of a vasopressin solution at pH 5.0 through hairless rat skin. FIG. 21A is a graph showing permeation rate of insulin solution at pH 7.1 through hairless rat skin using no iontotherapy as compared to permeation rate shown in FIG. 21B when using iontotherapy (TIDD). FIG. 22 is a series of graphs showing the comparative effects of the change in waveform in lowering blood glucose level (B.G.L.) in diabetic hairless rats using transdermal periodic iontothorapeutic system using insulin solution at pH 3.68. FIG. 23A is a graph showing lowering of blood sugar level (B.G.L.) of hairless rats using transdermal periodic iontotherapeutic system on Day 1 using insulin solution at pH 3.68. FIG. 23B is a graph showing further lowering of the blood sugar levels of the same rats on Day 3 using transdermal periodic iontotherapeutic system without further administration of insulin, indicating that the insulin deliv ered transdermally on Day 1 is stored in the skin tissues and can be activated to become available for absorption into systemic circulation on Day 3 by TPIS. FIG. 24A is a pair of comparative graphs show ing plasma immunoreactive insulin levels in diabetic rabbits af ter administration of insulin solution (pH 7.1) using transdermal periodic iontotherapeutic system (TPIS) compared with corresponding levels in diabetic rabbits using subcutaneous administration (SO ). "SZ injection" indicates injections to render rabbits diabetic. FIG. 24B is a pair of comparative graphs corresponding to those of FIG. 24A showing the respective reduction of blood glucose levels (B.G.L.). The data show that blood glucose levels can be controlled at a highly constant level so as not to fall substantially, if at all, belaw normal level by TPIS. FIG. 25A is a pair of compar ative graphs show ing the increase in plasma insulin concentration after administrat ion of insul in solution (pH 7.10) using tr ansdermal per iodic iontotherapeutic system (TPIS) compared to using transdermal ionotherapeutic system (TIDD) in which 4X current intensity and 2X administration times are used. TPIS administr ation shows more rapid attainment of increased plasma insulin concentrations. FIG. 25B is a pair of comparative graphs corresponding to those of FIG. 25A showing the attained lowering of blood glucose levels (B.G.L.) . The data show a near instanteous reduction of blood glucose level from the hyperglycemic level in the diabetic controls using transdermal periodic iontotherapeutic system (TPIS) whereas the reduction using transdermal iontotherapeutic system (TIDD) is lower than the normoglycemic level. FIG. 27 is a graph showing vasopressin permeation rate enhancement when the ionic strength of the vasopressin solution used in TPIS is decreased. FIG. 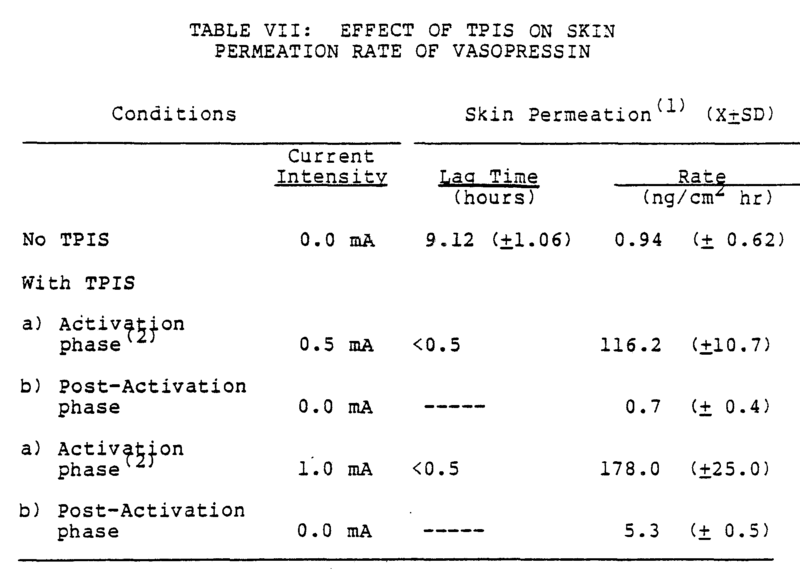 28 is a graph showing enhancement of skin permeation of vasopressin using TPIS with a short skin permeation lag time. The graph also shows reversibility of skin permeation within 2 hours after ceasing TPIS treatment and again enhancement of skin permeation after reinstituting TPIS. FIG. 1 is a diagram portraying a device of the invention in operation to deliver iontotherapeutically an ionized pharmaceutical and its uptake into the blood stream of the subject treated. The figure shows the iontotherapeutic device in electric contact with the skin. It also shows the pharmaceutical reservoir electrode in contact with the skin as well as the other electrode, which is referred to as the receptor electrode. The electrodes are in contact with the uppermost skin barrier, called stratum corneum. The pharmaceutical is transmitted through the stratum corneum and flows into the dermo-epidermal layer. The stratum corneum is the principal absorption rate limiting barrier. The first portion of the dermis layer is referred to as the papillary layer, which contains a capillary network of the vascular system. The capillary network takes up the transdermally absorbed pharmaceutical and the uptaken pharmaceutical is shown to flow from the capillary network into the main portion of the vascular system. FIG. 2 is a block diagram of a transdermal periodic iontotherapeutic device coming within the invention in which the power supply is derived either from the conversion of the alternate current (AC) from a 120 V-mains (or other available AC mains) into direct current or from a suitable battery. The power is turned on manually by a switch or automatically by a programmable timer. The device also consists of one or a combination of several electronic multifunction generators, a drug reservoir electrode and a receptor electrode. The multifunction generator is assembled with a power supply, to deliver direct current with periodic waveform of either square, triangular, trapezoidal or sinusodial shape, to an output circuit. The desired iontotherapeutically-effective waveform can be selected manually or preprogrammed through a switch (K1), and the frequency of the output waveform can be adjusted in the range of 10Hz-50KHz. The output circuit then provides a physiologically acceptable current, ranging up to 10 mA, to the pharmaceutical reservoir electrode which contains the ionized pharmaceutical to be delivered transdermally, and a receptor electrode in series. When desired, the device can be operated to deliver either DC current alone (periodically or continuously), or in combination with a periodic waveform. t2 = 0.693 P1 C where P's are potentiometers, C is a capacitor, and D's are diodes. During the operation, the capacitor C is charged through the potentiometer P1 and P2 and the diode D for t1 seconds and discharged through potentiometer P1 and diode D2 for t2 seconds. where Vo+ and Vo- are the higher and lower trip points of the comparator, respectively. Resistors R1 and R2 control the comparator trip points. Capacitor C is the integration capacitor. Potentiometer P1 provides adjustment of the tr iangul ar wave of f se t. Potent iometers P2 and P3 adj ust frequency and symmetry, respectively. The thi rd op-amp ci rcuit (C) acts as a damper . I t produces a trapezoidal wave with the same frequency as the triangular wave. Potentiometer P4 sets the clamping level. FIG. 6 is a detailed circuit diagram for the sinusoidal signal generator shown in FIG 2. The circuit of the generato r uses tw o ampl if ie r s : one (A) acts as a non- inver ting integrator, and the other (B) acts as an inverting integrator . They are connected in cascade to form a feedback loop. C's and P's are integration capacitors and the variable resistors, respectively. Resistor R1 is a feedback resistor. Capacitor C1 is used to prevent high-frequency oscillations. Circuit shown in FIG. 2. The desired waveform is selected manually or automatically from the 3 generators though a switch (K1) and sent to the inverting amplifier, from which the signal then goes to the output stage of two transistors. The output current (dose current) is adjusted by a potentiometer (P) , as monitored by a current meter (A) , and is delivered to the drug reservoir electrode (B) . DC alone or in combination with a periodic waveform, a dose current for a particularly designated time period. In certain applications, it may be advantageous in operating the devices of this invention to have the periodic current waveform remaining at some constant DC level during the off cycle. In this design of iontotherapeutic device, the drug reservoir electrode is positioned outside the device. FIG. 9 shows, an embodiment of another design of iontotherapeutic device coming within the invention. It shows two views of the device. The first view is a cross-sectional view showing the integrated circuitry, L.C. display, battery, drug reservoir electrode positioned directly in the lower central portion of the base and the receptor electrode encircling the drug reservoir electrode. The next view shows the bottom view of the device. In the center portion of the bottom view is shown the circular drug reservoir portion of the drug reservoir electrode. The drug or pharmaceutical dissolved in an aqueous solution is homogeneously dispersed in a polymer matrix unit dose as described herein. The pharmaceutical solution can also be contained in a reservoir-type unit dose having a microporous surface adapted to permit the drug to be transmitted. Next, there is shown the receptor electrode, as a circular ring positioned in spaced relationship from the drug reservoir electrode. At the top of the cross-sectional view is shown a liquid crystal displ ay. It can d ispl ay a number of f unctions , including whe the r or no t th e dev ice is in oper ations the type of periodic current and waveform being used and other pertinent information of the transdermal per iodic iontotherapeutic drug delivery. The battery employed as the power source for this invent ion can be a lithium or other nuclear battery having a voltage, for example, of from 6 to 12 volts. F IG. 10 is a block diag r am of a portable transdermal periodic iontotherapeutic device coming within the invention in w hich the pow er supply is der ived f rom a battery source such as one or mor e 9V batteries. The power is turned on manually by a sw itch. The device can be equipped so that it can be turned on automatically by a programmable timer. The dev ice also cons ists of one or a combination of several electronic multifunction generators, a drug reservoir electrode and a receptor electrode. The multifunction generator can provide periodic waveform of either square, triangular , trapezoidal or sinusodial shape, to an output circuit. The desi red iontotherapeutically eff ective wavef orm can be selected manually and the frequency of the output waveform can be adjusted to a physiologically acceptable frequency of at least 10 Hz and up to about 50 KHz. The output ci rcuit then provides a physiologically acceptable current, ranging up to 10 mA, to the pharmaceuti cal reservoi r electrode, which contains the solution of the ionized pharmaceutical to be del ivered transdermally, and a receptor electrode in series. When desired, the device can be operated to deliver either DC current alone (periodically or continuously), or in combination with a periodic waveform. The DC-to-DC-converter-and-batterv-voltage-monitor lC1' R1-R4' C1-C3' L1 and diode IN914 consist of a DC- to-DC converter which is incorporated in step-up application. The output voltage is elevated from 9V battery to 27V with the proper adjustment of R4. The output voltage of the battery is monitored by a battery voltage monitor which includes a zener diode D1, R5-R7, C4 and C106Y1. When output of 9-V battery drops below minimum acceptable volume of 8.3V, LED lights to indicate the need for recharging. Pulse generator and constant current output stage. IC2, D2-D5, T1 , C5, C6 and R8 are components of a triangle-wave generator. In this circuit, the charge and discharge currents for C6 come through the diode bridge formed by D2-D5. Bridge D2-D5 consists of four general purpose switching diodes with low-leakage characteristics, that serve to steer current in the proper direction through the current source made up of T1 and R8. The pin 3 of IC2 serves as a source of current for the timing network, and its state of high, or low determines the direction of current flow into or out of C6 for charge or discharge. Since both charge and discharge currents flow through the same current regulator circuit, the currents are equal and thus times of charge and discharge are equal. As a result, triangular waves are formed across C6. T2-T4 arid sent to pin 11 of IC4. In constant current output stage, IC923 is employed to serve as a current regulator. IC923 is originally designed to be a voltage regulator with an output current limit resistor R across pin 10 and pin 3. The maximum output current is set as 0.6/R. This feature is adapted to form a current regulator. As soon as the condition (Vout/RL)>IS is satisf ied (where Vout is the output voltage, RL, load resistance, and Is, output current preset) , the output current will be kept at the preset level. Intersil 7106 interfaced with a liquid crystal display is the heart of the current monitor. R23 is a shunt resistor. C8 and R24 consist of a RC oscillator which runs at about 48 KHz and is divided by four prior to being used as the system clock. C10 and R27, serve as an input filter. C11' C12 and R28 determine the display sensitivity. C9 is for auto-zero function. KHz. The output circuit then provides a physiologically acceptable current, ranging up to 10 mA, to the pharmaceutical reservoir electrode, which contains the pharmaceutical f or mul ation to be del ivered tr ansdermally, and a receptor electrode in ser ies. When desired, the device can be operated to deliver either DC current alone (periodically or continuously) , or in combination with a periodic waveform. 120V AC line power is stepped down by the transformer TF and rectified by diode bridge BR1 and BR2, respectively. The DC voltages are filtered by capacitors C1, C2 and C3, C4, and fed into voltage regulators IC11 and IC12, respectively. The output of IC11 provides a 5V supply and the output of IC12 provides a 27V supply. IC5 are quad 2-input multiplexers which consist of four 2- input multiplexers with common select and enable inputs. "off" time needed are set through BCD tnumbwheels. "on" and "off" is repeated for any desired length of time. The switch K2 is used to interrupt the operation and trigger the timer. IC13, diode bridge consisting of four IN914, T1, R28 and C5-C7 are components of a triangle wave generator. In this circuit, the charge and discharge currents for one of C6-C17 come through the diode bridge formed by four IN914, which serve to steer current in the proper direction through the current source made up of T1 and R28. The pin 3 of IC2 serves as a source of current for the timing network, and its state of high or low determines the direction of current flow into or out of the capacitor for charge of discharge. Since both charge and discharge currents flow through the same current regulator circuit, the currents are equal and thus times of charge and discharge are equal. As a result, triangular waves are formed across the working capacitor C.
R34. The higher the voltage applied to pin 2 is, the shorter the "on" time of the square waves, and vice versa. The duty cycle of the square waves covers the range of 1/10 to 10/1. The square-waves are amplified by T2 and T3 and then sent to three voltage follower T4 - T6. At the "on" time of the timer, two relays are closed and emitters of T4 - T6 are connected to pin 11's of IC15- IC17. IC15-IC17 Provide three-channel current outputs. Three IC923 are employed to serve as current regulators. lC923 is originally designed to be a voltage regulator with an output current limit resistor R across pin 10 and pin 3. The maximum current is set as 0.6/R. This feature is adapted to form a current regulator. As soon as the condition (Vout/RL)>IS is satisfied (where Vout is the output voltage, RL load resistance and Is output current preset), the output current will be kept at the preset level. R40, R45 and R50 are maximum current limit resistance respectively. R41, R46 and R51 are used to preset the desired current. C19-C21 are used to eliminate high frequency noise. The output currents are monitored by a current meter A. The switch K1 is used to select DC or pulse output. B.G.L.) in the diabetic hairless rats as the results of transdermal delivery of insulin from the pharmaceutical reservoir electrode (containing 250 IU of insulin at pH 3.6) by Transdermal Periodic Iontotherapetic System with squarewave periodic mode (1 mA; on/off = 1/1; Frequency = 2000 Hz) for 40 minutes. FIG. 16 is a graph showing the effect of the frequency generated by the Transdermal Periodic Iontotherapeutic Systern on the reduction of the elevated blood glucose level (% change in B.G.L.) in the diabetic hairless rats. The fre quency of 2000 Hz produces a greater magnitude and a longer duration of reduction than the 1000 Hz. Fig 17 is a graph showing the effect of the on/off ratio in the Transdermal Periodic Iontotherapeutic System on the reduction of tne elevated blood glucose level (% change in B.G.L.) in the diabetic hairless rats. By regulating the ratio, the magnitude and the duration of reduction in B.G.L in the diabetes can be controlled as desired. 5.3), with the dose current of 1 mA, on/off ratio of 8/1 and at a frequency of 2000 Hz, the treatment duration of 20-40 minutes appears to be equally effective. 5.3), with the dose current of 1 mA, on/off ratio of 1/1 and at frequency of 1000 Hz, the treatment duration produces a difference in the rate and the duration, but with equal effectiveness. (Example 14); FIG. 23. (Example 15); PIGS. 24A and 24B ( Example 16 ) ; F IG. 25 ( Example 17 ) ; F IG. 26 (Example 18) ; F IG. 27 (Example 19 ) ; F IG. 28 (Example 20) . In car rying out the iontother apeutic process for administering transdermally, systemically measured amounts of an ionized pharmaceutical compound, it is f irst necessary to provide the pharmaceutical-containing unit dose in which the pharmaceutical is in aqueous solution. The pH of the aqueous solution is adj usted to an ef fective pH either below or above the pKa or the isoelectric point of the pharmaceut ical . It is desi r abl e to adj ust the pH to an ef f ective level of about 1 pH unit above or below the pKa or isoelectric point of the pharmaceutical, preferably to an effective pH level of at least 1.5 or at least 2 pH units below or above the pKa or isoelectric point of the pharmaceutical. With particular pharmaceuticals, it is preferable to so adjust the pH either below or above the pKa or isoelectric point. For example, with regard to insulins, it is preferable to adjust the pH below the isoelectric point, such as to about 1.0 pH units or lower below the isoelectric point, which for commercial insulins is about pH 5.3. The formed unit dose is placed in the receptacle portion provided in the pharmaceutical reservoir electrode, so that the ionized pharmaceutical can be transdermally absorbed. If the unit dose form is a preformed self-contained unit dose, it can be held in the receptacle portion of the reservoir electrode by customary means such as clamping, snapping into position, adhesive, or the like. One convenient form of the unit dose for the ionized pharmaceutical solution is to disperse uniformly the aqueous solution of the ionized pharmaceutical in a polymeric matrix. The polymeric unit dose must be characterized by being able to release the ionized pharmaceutical, when the iontotherapeutic device is in operation, so that the ionized pharmaceutical can be absorbed transdermally. The unit dose is in electrical contact with the skin of the subject treated when the iontotherapeutic device is in operation. With regard to the unit dose in the form of a polymeric matrix dosage unit, there are a variety of polymers which can be used to make the polymeric matrix unit dose. In general, the polymer must be essentially non-ionic, hyrophilic, and compatible with the ionized pharmaceutical and the skin. The polymer used in making the matrix must permit the ionized pharmaceutical to be released during the operation of the iontotherapeutic device. Polymers which are suitable in making the matrix are usually referred to as being in the category of hydrophilic polymers or hydrogels. These include the following illustrative cellulose-type and other polymers: polyhydroxyethylmethacrylate hydroxypropylcellulose polyhydroxypropylmethacrylate hydroxypropylmethylcellulose polyglycerylmethacrylate polyacrylamide polymethacrylamide polyvinyl alcohol poly-N-vinyl-2-pyrrolidone In making the polymeric matrix unit doses, certain viscosity-inducing agents may be incorporated to increase the viscosity of the drug reservoir. For example, it has been found suitable to use viscosity-inducing polyethylene glycols. Polyethylene glycols having a molecular weight within the range of 1500 to 8000 are satisfactory. In making the polymeric matrix dosage units, it is suitable to take an amount of a suitable polymer and mix it with water, such as sterile, distilled water, to form a gel. The amount of the polymer used depends upon the type of polymer used and the viscosity imparted to the combination of water and polymer. Sufficient polymer should be used to result in a matrix which retains a sufficient structural integrity during storage and use. It has been found, for example, when hydroxypropylmethylcellulose is used as a matrix-forming polymer, that an amount of about 1.5 to 10%, based upon the amount of water used, is sufficient. It has been found suitable to use about 2% of the hydroxypropylmethylcellulose. Quantities of other polymers used will vary depending upon the type and the molecular weight of the polymer used and the nature of the final matrix disc desired. The disc is made by first dispersing the polymer, generally referred to as a hydrogel-forming polymer, in water, such as a double distilled and sterile water, or a suitable aqueous solution, such as the aqueous solution of a pharmaceutical. A buffer can be incorporated to maintain a desired pH level. If the desired pH is on the acid side, it has been found acceptable to use a citrate buffer, especially in the pH range of about 3 to 5. If the desired pH is on the basi c side , for example , a pH above 7 to about 9 , i t has been f ound sati sf actory to use a phosphate buffer. It has been found that simple adjustment of the solution pH is satisfactorily carried out, generally speaking, by adding HCl or NaOH, as the case may be. For example, 0.5 molar HCl or NaOH has been found sui table. Other conventional means as . known to those skilled in the art can be used to adj ust the pH level. In producing the hydrogel, for example, when hydroxyprcyylmethylcellulose is employed, the mixture of water and polymer is rapidly stirred to bring about a homogeneous dispersion of the polymer in the water to form a gel. High speed stirrers such as those capable of rotating at 500-1000 rpm, suitably about 600 rpm, can be used. It has been found that any stirring mechanism, including a stirring magnet, can be employed. It is generally desired to carry out the dispersion at slightly elevated temperatures, such as at about 50-100°C, depending on the polymer used. In producing the dispersion of hydroxypropylmethylcellulose, it has been found that a temperature of about 80°C is suitable. After the dispersion is produced, it is desirable to continue the stirring during the cooling of the dispersion. The dispersion should be cooled to a temperature slightly above the gelation temperature of the polymer before the pharmaceutical dissolved in water at a suitable concentration is incorporated to form the drug reservoir. In the case of insulin, it has been found that about 2 grams of insulin is satisfactorily dissolved in 100 ml of double-distilled, sterile water and the pH of the insulin, solution is desirably adjusted to an acid pH, for example, to a pH of about 3.6 using 0.5N HCl or other satisfactory acid-pH-adjusting agents. A suitable amount of the acidified insulin solution is added to the dispersion of the polymer in water prior to cooling to the gelation temperature. In the case of insulin, a 2% solution of insulin is a satisfactory concentration to be added to a 2% dispersion of the polymer in water in equal volumes. The material is then suitably cooled in a refrigerator, at about 5°C, to cause a congealing of the insulin-containing polymer dispersion. It has been found desirable to maintain the ionic strength of the ionized pharmaceutical solutions at a low level, such as not more than about 0.5 or 0.3. It has been found that such low level of ionic strength can provide greater transdermal absorption, such as from peptide solutions, e.g., from vasopressin solutions. 0.1-0.2 cm in thickness. The discs are suitably placed into a properly adapted form-fitting container, which then is aseptically closed as by use of a removable seal to cover the surface of the disc. The formed unit doses then can be placed as required into the receptable of the reservoir electrode. The unit doses must have means to form electri cal contact with the terminus of the lead from the output circuit to the reservoir electrode. Captopril, Triazolam, Chlordiazepoxide, Amitryptilline, Dobutamide, Sulfamethoxazole, Trimethoprin, and the like. The ionizable peptide pharmaceuticals used in the processes and the unit doses of this invention and administered by the devices of this invention are those which are pharmaceutically effective and transdermally absorbable. Desirably the peptides have at least five amino acid units and more desirably at least nine amino acid units. In operating the process, using for example a wristwatch-type iontotherapeutic device such as provided by this invention, the appropriate unit dose containing the pharmaceutical required for the desired therapy is assembled in the receptacle portion of the pharmaceutical reservoir electrode. For example, if insulin is to be administered and the pH of the insulin solution in the dosage unit is pH 3.6, insulin is a cationic and therefore the dosage unit is assembled as a part of pharmaceutical reservoir electrode, which is the anode. The desired waveform is selected, such as a square waveform. Tne pharmaceutical reservoir electrode used preferably is adapted to receive a disposable unit dose, e.g., a polymeric matrix unit dose, and to make electric contact with the skin of the subject being treated. Such means is assembled in place. The other variables are selected or pre-selected, such as the frequency, the dose current and on/off ratio. The device is attached to the subject being treated as by a band attached to the device and adapted to be attacheα to and detached from the subject. The switch of the device is turned to "on" position and the device commences operation of the iontotherapeutic process, which causes the ionized pharmaceutical of reservoir electrode to be administered transdermally and iontotherapeutically to provide a systemic dosing. The particular waveform, mA, pharmaceutical reservoir electrode (i.e., cathode or anode), frequency, length of treatment and other factors will be selected depending upon the pharmaceutical being administered, the subject being treated and others. 10 hours, depending upon factors such as the pharmaceutical, the subject being treated, the iontotherapeutic factors selected and the like. The following Examples are illustrative of the invention but are not intended to be limiting. IU/ml is prepared by dissolving 96.9 mg (25.8 IU/mg) of pure insulin in 10 ml of double-distilled, sterile water and adjusted to pH 7.1 with 0.5N NaOH. Two ml of the insulin solution so prepared is filled into a refillable dosage unit having a microporous membrane as the drug-releasing surface. This insulin-containing reservoir-type dosage unit is then assembled as a part of the pharmaceutical reservoir electrode and applied on the abdominal skin of 3 diabetic hairless rats with the transdermal periodic iontotherapeutic system operating at 2 mA with direct current mode or squarewave periodic mode (on/off = 4/1; Frequency = 2000 Hz). The results on the reduction in blood glucose level are shown and compared in FIG. 14. 80°C. After the hydroxypropylmethylcellulose is dispersed homogeneously, the stirring is continued while the mixture is cooled to about 40°C. The insulin solution prepared above is then added to the dispersion of hydroxypropylmethylcellulose with intermittent stirring to avoid any denature of insulin molecules, using the same stirring mechanism as described above, at the same stirring rate of 600 rpm for a period of two minutes. The insulin/hydroxypropylmethylcellulose solution is then placed in a refrigerator for congealing to occur. The insulin-containing polymer matrix is cut into disc-shaped parts with the appropriate dimensions, such as 2.5 cm in αiameter and 0.2 cm in thickness. The insulin-containing discs are stored at 5°C. The concentration of insulin in the discs is about 250 IU/gm. An aqueous solution of insulin at a concentration of 250 IU/ml is prepared by dissolving 193.8 rag (25.8 IU/mg) of pure porcine insulin in 20 ml of citrate buffer at pH 3.6. Two ml of the insulin solution so prepared is filled into a refillable dosage unit having a microporous membrane as the drug-releasing surface. This insulin-containing reservoirtype dosage unit is then assembled as a part of the pharmaceutical reservoir electrode of the iontotherapeutic device and applied successively on the abdominal skin of 9 diabetic hairless rats with the transdermal periodic iontotherapeutic system operating at 1 mA with square waveform mode to study the effect of frequency, on/off ratio and treatment duration on the reduction of blood glucose level. The results are shown and compared, respectively, in FIGS. 16, 17 and 18. 2 min. periodically on the hour for 12 hours at either DC mode or periodic square wave mode (frequency, 2000 Hz; on/off ratio, 1/1) . The results are shown in Table I. Example 7 A saturated solution of propranolol (pKa = 9.45), a beta-blocker type anti-hypertensive drug, is prepared in citrate buffer at pH 3.68. The enhancing effect of the transdermal periodic iontotherapeutic system is studied under the same conditions as that outlined in Example 6. 1) In the Valia-Chien skin permeation cell, a donor solution containing 13.3 mg/ml of propranolol (pKa = 9.45) at pH 3.68 was applied topically to hairless rat skin at 37°C. 2) TPIS applied a DC current of 1 mA periodically at 10 min/hr, a frequency of 2000 Hz and an on/off ratio of 4/1. 1) In the Valia-Chien skin permeation cell, a donor solution containing 23.9-5 mg/ml of verapamil (pKa = 8.9) at pH 3.68 is applied topically to hairless rat skin at 37ºC. 1) In the Valia-Chien skin permeation cell, a donor solution containing 6.2 mg/ml of tetracycline HCl (pKa = 3.3, 7.8 and 9.7) at pH 9.0 is applied topically to hairless rat skin at 37°C. 2) TPIS appl ied a DC cur r ent of 1 mA periodically at 10 min/hr , a f requency of 2000 Hz, a square waveform and an on/off ratio of 4/1. 4.5, the pKa. The enhancing effect of the transdermal periodic iontotherapeutic system is evaluated under the same conditions as that outlined in Example 6. The results are shown in Table VI. *TPIS applied a DC current of 1.2 mA periodically at 5 min/hr, for 7 hours, with a frequency of 2000 Hz, a square waveform and an on/off ratio of 2/1. An aqueous buf fer solution of vasopressin (50 mcg/ml containing 1.7 mcCi/ml H3-vasopressin) is prepared in citrate-phosphate buffer at pH 5.0. An aliquot of 3.5 ml of this vasopressin solution is f illed into the ref illable dosage unit having a microporous membrane as the drugreleasing sur f ace. The dosage uni t is then assembled as a part of the pharmaceutical reservoir electrode of the iontotherapeutic device and membrane surface thereof is applied to the stratum corneum side of hairless rat skin mounted in the Valia-Chien skin permeation cell at 37°C. Samples are withdrawn at regular intervals and radioactivity is measured by scintillation counter to determine the amount of vasopressin which has been transdermally absorbed. 1) In-vitro permeation across hairless rat skin mounted in the Valia-Chien permeation cell. 2 KHz, by multi-channel TPIS unit (shown in FIG. 20 for 10 min. per 40 minute period, treatment repeated for six 40- minute cycles. An aqueous so l ution of insul in (5.3 IU/ml containing 0.3 mcCi of I125-insulin) is prepared and adjusted to pH 7.1 using NaOH. An al iquot of 3.5 ml of this insul in so l ution is fi l l ed into the refi l lable dosage unit having a microporous membrane as the drug-releasing surface. The dosage uni t is then assembl ed as a part of the pharmaceutical reservoir electrode of the iontotherapeutic device and mem brane surface thereof is applied to the stratum corneum side of hairless rat skin mounted in the Valia-Chien skin permeation cell at 37°C. Samples are withdrawn at regular time intervals and radioactivity is measured by scintillation counter to determine the amount of insulin which has been transdermally absorbed. 7-hr. period with permeation data of same insulin solution using TIDD iontotherapy. 37°C. Samples are withdrawn at regular time intervals and radio-activity is measured by scintillation counter to determine the amount of insulin which has been transdermally absorbed. The results demonstrate that insulin permeates through the hairless rat skin at constant, but rather slow rate for 48 hours, with permeability coefficient ranging from 6.50 (±1.42) to 10.02 (±1.94)x 10-7 cm/hr (Table VIII). Permeability coefficient is the ratio of the steady state rate of skin permeation of the pharmaceutical which is tranjdermally absorbed/the concentration of the pharmaceutical solution which is applied transdermally. The pharmaceutical in this experiment is insulin. 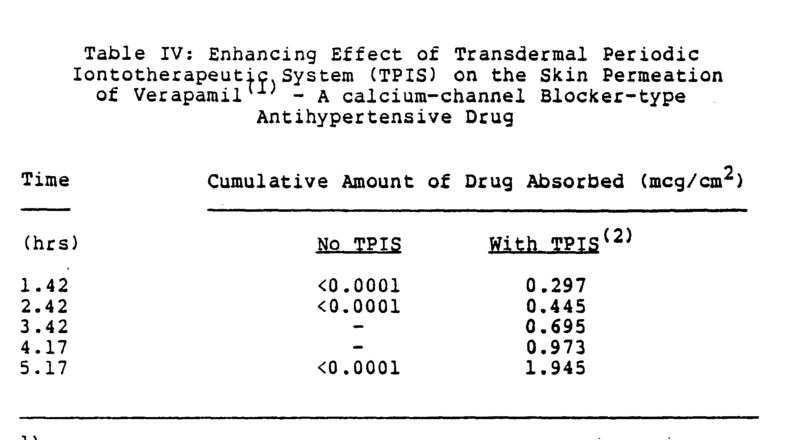 (pH 3.7) shows greater increase in TPIS-facilitated skin permeability. Example 14 An aqueous buffer solution of insulin (250 IU/ml) is prepared in citrate-phosphate buffer at pH 3.68. An aliquot of 2.5 ml of this insulin solution is filled into the refillable dosage unit having a microporous membrane as the drug-releasing surface. The dosage unit is then assembled as a part of the pharmaceutical reservoir electrode of the iontotherapeutic device and membrane surface thereof is applied to the skin at abdominal region of 3 groups of anaesthetized, diabetic hairless rats. Blood samples are withdrawn at regular time intervals and glucose levels are measured by glucose analyzer. The reduction in glucose level from hyperglycemic state is the pharmacodynamic responses to the insulin absorbed transdermally. The results demonstrate that when the skin is treated with transdermal periodic iontophoretic system (TPIS) at current intensity of 1 mA, frequency of 2 KHz, on/off ratio of 1/ 1 , f or 40 min. the b l ood g lucose lev el s are reduced sub s tant i a l l y. The dat a show that th e time cou r se and th e extent of reduction in b l ood g l ucose l evel s in di abetic rats v ary with the type of waveform used (FIG. 22) . Example 15 An aqueous buffer solution of insulin (250 IU/ml) is prepared in citrate-phosphate buffer at pH 3.68. An aliquot of 2.5 ml of this insulin solution is filled into the refillable dosage unit having a microporous membrane as the drug-releasing surface. The dosage unit is then assembled as a part of the pharmaceutical reservoir electrode of the iontotherapeutic device and membrane surface thereof is applied to the skin at abdominal region of 5 anaesthetized, diabetic hairless rats. Blood samples are withdrawn at regular time intervals and glucose levels are measured by glucose analyzer. The reduction in glucose level from hyperglycemic state is the pharmacodynamic responses to the insulin absorbed transdermally. (B.G.L.) can be appropriately reduced in a more controlled manner than by daily SC dosages so as to prevent B.G.L. to fall below normal levels. An aqueous solution of insulin (500 Iϋ/ml) at pH 7.10 is used. An aliquot of 2.5 ml of this insulin solution is filled into the refillable dosage unit having a microporous membrane as the drug-releasing surface. The dosage unit is then assembled as a part of the pharmaceutical reservoir electrode of the iontotherapeutic device and membrane surface thereof is applied to the abdominal skin of 2 groups of diabetic rabbits. Blood samples are withdrwan at regular time intervals and analyzed for immunoreactive insulin concentration by radioimmunoassay and for glucose levels by glucose analyzer. The reduction in glucose level from hyperglycemic state is the pharmacodynamic responses to the insulin transdermally absorbed. 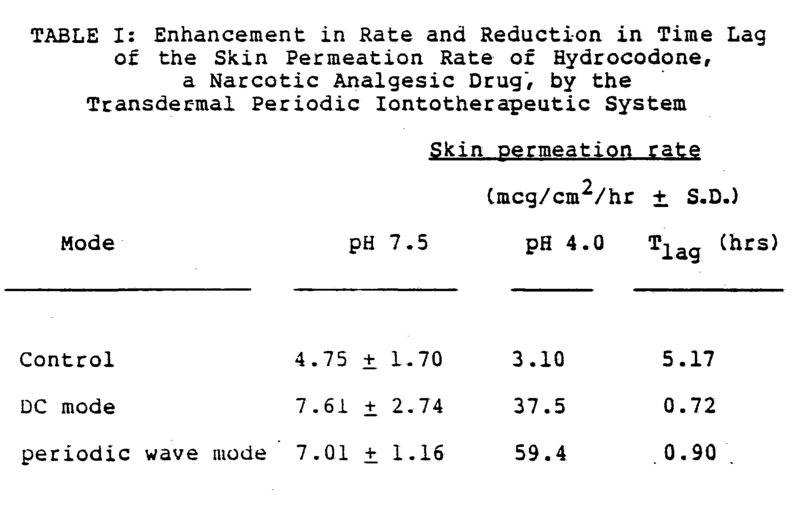 The results demonstrate that when the skin is treated with transdermal periodic iontophoretic system (TPIS) at current intensity of 1mA, frequency of 2 KHz, on/off ratio of 1/1, and square waveform for 40 min., the the plasma immunoreactive insulin concentration increases more rapidly and the blood glucose levels are reduced more instantaneously than transdermal iontophoretic delivery (TIDD) at current intensity of 4 mA for 80 min. (FIG. 25). The data in FIGS. 25A and B show that the TPIS system of this invention provides both a more rapid increase in plasma insulin concentration after administration and a more rapid reduction in blood glucose level than use of TIDD even though the cor responding current intensity in the TIDD system is 4 times as much (4 mA vs. 1mA) and administration is 2 times as great (80 minutes vs. 40 minutes) as in the TPIS system. Example 18 An aqueous buffer solution of vasopressin (40 IU/ml) is prepared in citrate-phosphate buffer at pH 5.0. Vasopressin i s an ant i-d i u r e tic pharmaceut i ca l , whi ch i s used by patients which have an excessive urine output. Vasopressin caused a r eduction of urine output and an increase in ion content , such as sodium ion content. Ion content in the urine is determined by using osmol arity measurement. An al iquot of 3.5 ml of this vasopressin solution is f i l led into the refillable dosage unit having a microporous membrane as the drug-releasing surface. The dosage unit is then assembled as a part of the pharmaceutical reservoir electrode of the iontotherapeutic device and membrane surface thereof is applied to the abdominal skin of 2 groups of anesthetized rabbits. Blood samples are withdrawn and urine samples are collected at regular time intervals and urine osmolarity is measured by osmometer. The increases in osmolarity from the basal level are the pharmacodynamic responses to the vasopressin transdermally absorbed. An aqueous buffered solution of vasopressin (50 mcg/ml containing 1.7 mcCi/ml H3-vasopressin) is prepared in citrate-phosphate buffer at pH 7.4 with varying ioriic strengths. An aliquot of 3.5 ml of this vasopressin solution is filled into the refillable dosage unit having a microporous membrane as the drug-releasing surface. The dosage unit is then assembled as a part of the pharmaceutical reservoir electrode of the iontotherapeutic device and membrane surface thereof is applied to the stratum corneum side of hairless rat skin mounted in the Valia-Chien skin permeation cell at 37°C. Samples are withdrawn at regular time intervals and radioactivity is measured by scintillation counter to determine the amount of vasopressin which has been transdermally absorbed. 30 hours (1.32 ± 0.38 ng/cm2/hr). (referred to as "passive diffusion") to the range of 65.9 ( ± 13.1) to 632.6 (± 65.0) ng/cm2/hr, depending upon the ionic strength of vasopressin solution. The results of the experiment are shown in the following TABLE IX. 1) The rates determined in the activation phase with lag time ranging from 0.48 (± 0.21) to 0.86 (± 0.15) hrs. 0.064. An aliquot of 3.5 ml of this vasopressin solution is filled into the refillable dosage unit having a microporous membrane as the drug-releasing surface. The dosage unit is then assembled as a part of the pharmaceutical reservoir electrode of the iontotherapeutic device and membrane surface thereof is applied to the stratum corneum side of hair less rat skin mounted in the Valia-Chien skin permeation cel l at 37°C. Samples are withdrawn at regular time intervals and radioactivity is measured by scintil lation counte to determine the amount of vasopressin which has been transdermally absorbed. 30 hour s (0.98 ± 0.26 ng/cm2/hr) . When the skin is treated with transdermal per iodic iontophoretic system (TPIS) at current intensity of 0.3 mA f requency of 16 KHz , on/of f ratio of 1/ 1 , for 60 min. , the s kin permeation prof iles are enhanced with rate increases from 0.98 (±0.26)ng/cm2/hr (referred to as "passive diffusion") to 757.3 (± 53.2) ng/cm2/hr (FIG. 28), while the duration of time lag is reduced from 9 hours down to 0.40 (± 0.06) hours. The data in FIG. 28 demonstrate the reversibility of skin permeability that in less than 2 hours after the TPIS treatment, the skin permeabil ity returns to the rate bef ore the TPIS treatment. Then, TPIS can be appl ied again to facil itate the skin permeation of vasopressin. 2. A process of Claim 1 in which the pH of the peptide solution is at least about 1.5 pH units below or above the isoelectric point of said peptide. 3. A process of Claim 1 in which the pH of the peptide solution is at least about 2.0 pH units below or above the isoelectric point of said peptide. 4. A process of Claim 1 in which the pH of the peptide solution is about 1.5 or about 2.0 pH units below the isoelectric point of the peptide. 5. A process of Claim 1 in which the peptide is insulin and the pH of the insulin solution is in the range of about pH 3.0 to pH 4.0. 6 . A proces s of Cl aim 5 in whi ch the pH of the insul in s oluti on i s about pH 3.6. 7. A process of Claim 1 in which the current intensity is not more than about 5 mA based on a r eservo i r electr ode/ skin-contacting area of about 5 cm2. 8. A process of Claim 1 in which the current intensity is not mo r e than about 2 mA based on a r ese rvo ir electr ode/ skin-contacting area of about 5 cm2. 9. A process of Claim 1 in which the current intensity is not more than 1 mA based on a reservoir electrode skincontacting area of about 5 cm2. 10. A process of Claim 1 in which the periodic DC current has a square waveform. 11. A process of Claim 1 in which the periodic DC current has a triangular waveform. 12. A process of Claim 1 in which the periodic DC current has a sinusoisal waveform. 13. A process of Claim 1 in which the periodic DC current has a trapezoidal waveform. 14. A process of Claim 1 in which the peptide has at least 5 amino acid units. 15. A process of Claim 1 in which the peptide has at least 9 amino acid units. 16. A process of Claim 15 in which the peptide has 9 amino acid units. 17. A process of Claim 16 in which the peptide is vasopressin. 18. A process of Claim 1 in which the periodic DC current has an administration time of less than about 1 hr followed by multiple repeats of said periodic DC current administration, said periodic DC current administrations being spaced by intervals which are at least as long as the periodic DC current administration times. 19. A process of Claim 18 wnerein the solution is an insulin solution having a pH which is at least about 1.5 pH units lower or higher than the isoelectric point of the insulin, the current intensity not more than about 2 mA based on a reservoir electrode skin-contacting surface area of about 5 cm2, the administration times are not more than about 40 minutes, and the repetition frequency is at least about 1000 Hz. 20. A process of Claim 19 in which the periodic waveform is in the square form. 21. A process of Claim 19 in which the periodic waveform is in the triangular form. 22. A process of Claim 19 in which the periodic waveform is in the sinusoidal form. 23. A process of Claim 19 in which the periodic waveform is in the trapezoidal form. 24. A process of Claim 1 in which the solution is an insulin solution having a pH which is at least about 1.5 pH units lower or higher than the isoelectric point of the insulin, said insulin transdermally administered at a rate having a skin permeability coefficient of at least 35 x 10-7 cm/hr as measured in the Valia-Chien cell using a current intensity of 1 mA, on/off ratio of 1/1, and a repetition frequency of 2000 Hz. 25. A process of Claim 24 in which pH is at least about 1.5 pH units lower than the isoelectric point of insulin. 26. A process of Claim 24 in which the pH is about 3.6. 27. A process of Claim 1 in which the ionic strength of said solution does not exceed about 0.5. 28. A process of Claim 27 in which an ionic strength of said solution does not exceed about 0.3. 29. A process of Claim 27 in which the peptide pharmaceutical is an insulin or vasopressin. 30. A sterile unit dose adapted to be removably inserted into the receptacle of a reservoir electrode of a transdermal periodic iontotherapeutic system, said unit dose to be used in electrical contact with intact skin to be iontotherapeutically treated to administer transdermally a systemically effective dose amount of a pharmaceutically effective and transdermally absorbable peptide; said unit dose containing a sterile solution of said peptide having an iontotherapeutically effective and physiologically acceptable pH at least abcut one pH unit lower or higher than the isoelectric point of said peptide so as to provide said pharmaceutical in ionized form; said unit dose adapted to permit said peptide to be released upon application to the reservoir electrode of a periodic DC current using a selected waveform in an iontotherapeutic process. 31. A unit dose of Claim 30 in which the pH of the peptide solution is at least about 1.5 pH units above or below the isoelectric point of the peptide. 32. A unit dose of Claim 31 in which the peptide is contained and uniformly dispersed in a polymeric matrix disc in which the polymer used in making the matrix disc is essentially non-ionic, hydrophilic and essentially compatible with said peptide and the intact skin to be treated. 33. A unit dose of Claim 32 in which the polymer is a cellulose-type polymer. 34. A unit dose of Claim 31 in which the peptide is insulin. 35. A unit dose of Claim 34 in which the pH is in the range of 3.0 to 4.0. 36. A unit dose of Claim 34 in which the pH is about 3.6. 37. A unit dose of Claim 31 in which the peptide is insulin and the pH is about 3.6. 38. A unit dose of Claim 30 in which the peptide is vasopressin. DC current and said unit dose adapted to be in electrical contact with said terminal; and 5) receptor electrode adapted to be in electrical contact with the intact skin to be treated and for ming w ith said pharmaceutical reservoir electrode a co mb i nat i on of anode and cathode electrodes . 40. A device of Claim 39 in which the waveform is the square form. 41. A device of Claim 39 in which the waveform is the triangular form. 42. A device of Claim 39 in which the waveform is the sinusoidal form. 43. A device of Claim 39 in which the waveform is the trapezoidal form. 44. A device of Claim 39 which is portable. 45. A device of Claim 39 which can be worn by the subject being treated iontotherapeutically. 46. A device of Claim 39 which is multi-channeled. 47. A device of Claim 46 which can be applied to multiple number of subjects being treated iontotherapeutically. NO881292A NO881292A (en) 1986-07-25 1988-03-24 Iontoterapeutisk apparatus, method and unit dose. FR2719997A1 (en) * 1994-05-23 1995-11-24 Samsung Electro Mech Device insulin transcutaneous delivery patch. EP0647133A4 (en) * 1992-06-12 1997-10-29 Affymax Tech Nv Compositions and methods for enhanced drug delivery. EP0604504A4 (en) * 1991-08-26 1995-05-17 Univ Rutgers Iontotherapeutic device and process. ES2217320T3 (en) 2004-11-01 Delivery apparatus electrotransport agents.